Playing on one of the best high school basketball teams of all-time with three other future NBAers — Reggie Lewis (top left), Reggie Williams (top center), and David Wingate — Muggsy Bogues, though the "Short Man" (as he was called), was noted as the 'catalyst' of said team that went 31-0 to become ranked as the USA Today #1 high school team in the country. 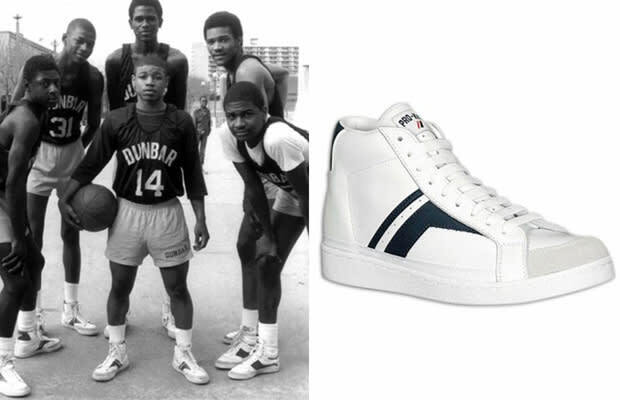 The Pro-Keds Shotmaker, with its durable vulcanized sole and leather upper, was a pioneer amongst basketball sneakers and a shoe that was appreciated by both ballers and breakdancers alike. Oh yeah, Sam Cassell and Tupac Shakur also had brief stints at Dunbar. Also, let's not forget THIS.